One of the best things about late autumnal weather in the Wakatipu Basin is that it’s more predictable than other times of year, so it’s the perfect time to get outdoors, explore and have a few adventures. Stand-up paddle boarding is the world’s fastest growing water sport. It purportedly started in Hawaii, when bored surfers used paddles to get around on their boards when the surf was poor. It’s great for your core strength and is a relatively easy sport to get into. Once you’ve mastered standing up and balancing on the board, you can explore the lake’s edges, go fishing or even (for an extra workout) do some yoga moves. There’s two kinds of SUPs – solid boards, made of wood or hard foam, and inflatable boards which deflate down into a large pack that’ll easily fit into the boot of a small car. You can hire inflatable SUPs from Small Planet in central Queenstown, or from whatsupqueenstown.com. It costs around $45 for four hours and includes everything you need. Remember to wear a PFD (personal floatation device) – this is a requirement on Lake Wakatipu. Kayaks are also popular on Lake Wakatipu, but it’s the convenience of inflatable SUPs that’s driving the paddle board trend. Woolshed Bay in Jack’s Point is a great place to start, the water is protected from the wind so it’s usually flat. The beach area is another great place to launch and once you’re confident, there’s loads of spots around the lake to choose from – adventures to Pidgeon Island from a beach just off Glenorchy Road is a good challenge and the flat and shallow Frankton Bay area is a good spot for children to try SUP. You could paddle on Lake Tewa, but the bottom is muddy (not fun to wade into) and there’s not much room to explore – you’ll have much more fun on Lake Wakatipu. The water is typically calmest before 11am, this is a perfect excuse to sneak in a pre-work or pre-school paddle! A top tip for beginners: the blade of the paddle should slope away from you, so you’re ‘pushing’ the water rather than ‘scooping’ the water. Holding the paddle backwards is the number one beginner SUP faux pas. Yes, people really do swim in Lake Wakatipu. The lake is one of New Zealand’s coldest, so most (though not all) local swimmers prefer to wear wetsuits. The upside to swimming in cold water is that it’s very clear and there’s not much living in it – you certainly won’t bump into jellyfish and eagle rays like Wellington swimmers might. The Queenstown Masters Swim Group (https://groups.qldc.govt.nz/groups/show/southern-lakes-masters-swimming-club/) is a social group which meets regularly to train in the open water and at Alpine Aqualand pool in Frankton. The group have arranged a swim lane in Frankton, starting near the Scouts Club. It’s a great group for building your open water confidence and challenging yourself. Similar to SUP, there’s plenty of great, wind-sheltered spots to swim in Woolshed Bay and Jack’s Point beach. If you swim regularly by yourself, it’s a good idea to get a swim bouy – a lightweight float that you attach to your body – this will help ensure you can be spotted by other lake users. If you’re interested in climbing and bouldering, get involved with the Queenstown Climbing Club (http://www.queenstownclimbing.com) asap. This great social group started with a few passionate locals back in 2008; the club now has more than 200 members. It’s run by volunteers and it’s thanks to their hard work that so many excellent climbing spots are available for use. Close to Jack’s Point is a section of privately owned farmland known as Jardine’s (note: this is different to Jardine’s Park in Kelvin Heights). The club has arranged access on the condition that users protect and respect the land (close gates, respect livestock and don’t leave any rubbish behind). The Remarkables tower over the area, which is strewn with large boulders that are great fun to climb. 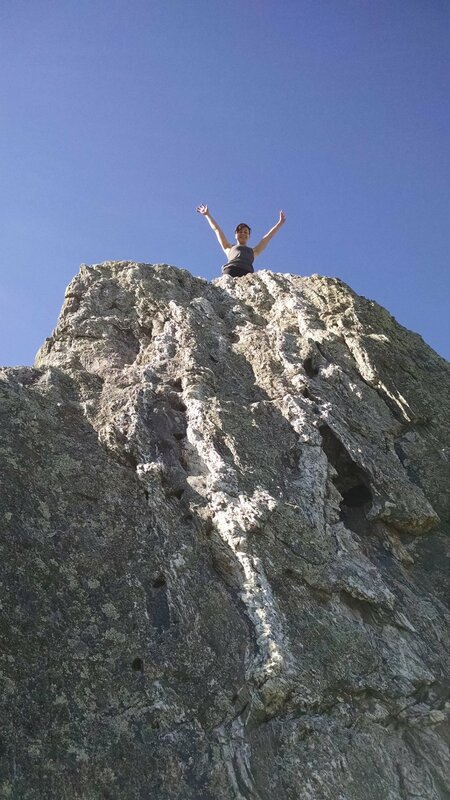 For more experienced climbers, the climbing club also maintains two dry tooling crags near the Kelvin Heights end of the Kelvin Heights to Jack’s Point trail. Climbing shoes and equipment can be hired from Small Planet in town. There’s far too many good local hikes to list here, but the nearby Wye Creek track is worth a mention. The starting point is less than 10 minutes’ drive from Jack’s Point in the direction of Kingston. The parking area is unannounced, so keep your eyes peeled for the access gate. The great thing about this track is that there’s a few options. The lower part of the track takes around one hour and leads to a helicopter pad and a great climbing spot. The pad is a stunning place to stop for lunch (note: I’ve never seen a helicopter land here) and has great views across Lake Wakatipu towards Jack’s Point. To access this part of the track, you’ll need to cross over the hydro dam, which you’ll come across about 45 minutes into the uphill walk. If you turn left at the dam, you’ll end up on the ‘true’ Lower Wye Creek Track. This zig-zags up the Remarkables to a beech forest and comes out by the lower part of the creek where there’s yet more great climbing spots. This will take an additional hour. If you’re really up for a challenge, you can keep following Wye Creek through tall grasses and spikey Spaniard speargrass until you reach Lake Alta, at the Remarkables ski area. There’s excellent camp spots along this track, but you’ll need to arrange a car swap – or be prepared to turn around and walk back! This track takes around 6 – 8 hours. Hint: this longer track is easier walked from Lake Alta to Wye Creek as in this direction, it’s mostly downhill.